With brilliant conditions the order of the day, world-beater Hank McGregor and young starlet Kyeta Purchase took home honours at the Borland Surfski Challenge presented by Marriot, race three of the 2019 Marine Surfski Series on Friday. With last week’s race two having to be cancelled due to strong winds, Friday’s race three conditions were as good as they get with some good bumps for paddlers heading to the turn can and the southerly wind that was blowing meant it was a great evening on the water. At the sharp end of the race, Marine Series king Hank McGregor once again proved that he is one of the best in the world with his second win in as many races, 18 seconds ahead of Matt Bouman in second and Capetonian Mark Keeling in third. “We were a little worried about conditions beforehand but everything seemed to turn at the last minute and we had some brilliant conditions,” Euro Steel/Fenn Kayaks’ McGregor said. “I managed to get a jump on the guys at the beginning and hold on to the advantage throughout which I was really happy about. The beginning of the year often means that McGregor is experimenting with equipment and he used Friday’s race to test out a new surfski. “It’s great to use the Marine Series as a place to test out new kit because the racing and the competitors are so consistent so you get a good idea if the equipment is right for you. The ladies race was were all the drama unfolded with Euro Steel/Fenn Kayaks’ Jenna Ward holding all the cards coming into the finish, however a meeting with the sharks nets derailed her quest for a second win of the season. Her mishap opened the door for Purchase and Michelle Burn to fight it out for the win. With an exciting end sprint on the cards it was the younger Purchase who came away with her first win of the series, eight seconds ahead of Burn in second while Ward came home in third. The river racing dream team of Owen Gandar and Andrew Houston showed they are no mugs in the ocean as they finished third overall and first double with the second double of Lance Howarth and Shaun Burgin just under two minutes behind. Maritzburg College’s Hamish Mackenzie was the first junior boat home ninth overall and seventh single. In the short course Simon and Chris Grolt were the first boat home ahead of Zoog and Lia Hayns with Bruce and Sarah-Anne Pender-Smith in third. Under 16 paddler Lungelo Shange was the first single home on the short course. Brendon Germaine was the first stand-up paddle boarder over the line. 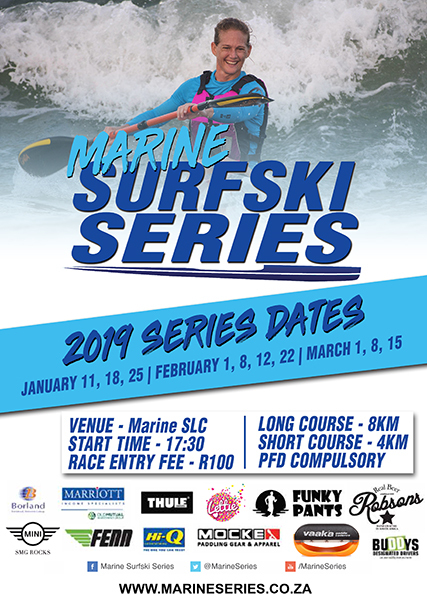 The fourth race of the 2019 Marine Surfski Series is Thule Surfski Challenge on 1 February.